Baking is truly one of the most therapeutic things you can do. The motion, the rhythm, not to mention the glorious scents that fill your kitchen, all help to alleviate any stress or unpleasant feelings that may be weighing down upon you. I know that if I'm feeling down I can always head into the kitchen, and all of my worries will just melt away. So there you have it. Baking makes me happy. I am never not in the mood to bake. Do you know what else makes me happy? Fresh, local fruit. My mom came home from the grocery store a couple of days ago with an enormous bucket of strawberries from a farm only a little ways away from my house. I almost started drooling when she plopped them down in front of me. For days, I ate them straight out of the bucket with no embellishment. That really is the best way to treat good fruit. Unfortunately, or fortunately depending on how you look at it, I had barely made a dent in the strawberries. It seemed to be an endless tub. I didn't want them to go to waste, so I started brainstorming. 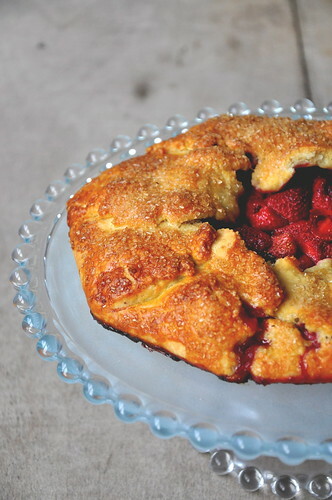 As much as I love strawberries, I don't often love baked goods that incorporate strawberries. Something about the heat of the oven takes the complexities out of a strawberry and reduces it down to a generic sweetness. The exception to this rule is the strawberry tart. The crumbly crust cradles the tenderized strawberries and allows them to keep more of their original flavor somehow. 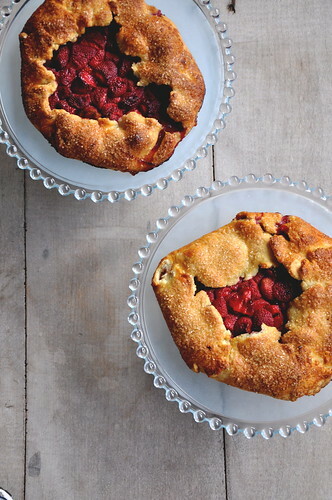 Martha Stewart has always delivered when it comes to tarts. I've yet to make one of her tarts that did not come out fabulously (remind me to tell you about her lemon tart we make). This galette was no different. 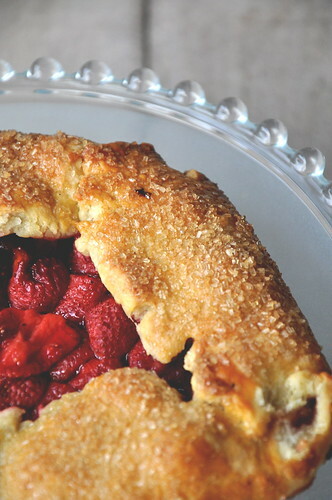 The strawberries were unctuous and juicy, and the cornmeal in the crust made it pleasantly sandy and naturally sweet. I loved it. Pulse together the flour, cornmeal, sugar, and salt in the bowl of your food processor. Put the chunks of butter into the bowl and pulse until they are pea-sized. Add the water in a steady stream through the feed tube and pulse until the dough comes together in a ball. Divide the dough in half, wrap each disc in plastic, and refrigerate for an hour. Roll out the discs of dough into 14-inch rounds on a floured surface. Preheat the oven to 375 degrees. Toss the strawberries, sugar, lemon juice, cornstarch, and salt together in a large bowl. Spread the fruit mixture evenly onto each round of dough. Fold up the edges of the dough and pinch together. Brush the exposed crust of each galette with the brushed egg and sprinkle with the sanding sugar. Put the tarts onto baking sheets lined with parchment paper and place on the center rack of the oven and bake for 45 minutes. Once they are golden brown, remove the baking sheets from the oven and allow to cool on a wire rack. I have to say, your pictures have improved dramatically since you've first been blogging! And the new camera doesn't hurt, either. I believe I partook of this entry's baked product, and 'twas truly delicious! Everything on here looks great! this is are great recipe now because the berries are all in season. 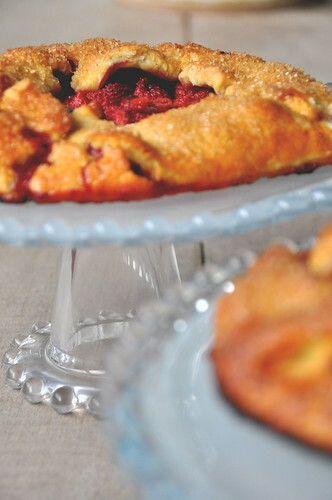 ok so i was checking the blog over breakfast because I hadn't been on in a while, and I want this strawberry galette! this looks like one of the best desserts that you have ever made, and I am even willing to splurge of weight watchers to try some! PLEASE MAKE IT AGAIN! galette !! wow, i think this will be my new "go to." i cut most of the corners. can i tell you without insulting you !! before i start, i want to say, i will make the dough with whole wheat and or corn meal at some point, but this was a lesson on exploring the dough fold technique, and the taste for the sugar. don't scream too loud..... i bought two of the ready made pie shells. i thawed them, i rolled one out on a cookie sheet. i poured about 2 cups of blue berries in the middle and spread them out, but not too close to the edge. sprinkled about a teaspoon of sugar on the blueberries. then i just folded the dough up onto itself. sprinkles another teaspoon of sugar over the dough edges. baked for about 30 minutes. and even fought over it a little bit.